3.By using ultrasonic technology, it produces cool, dry fragrant mist and ensures the integrity of the essential oils' beneficial molecular structure and allows for ease of healthy bodily absorption. 400 ML CAPACITY, EXCELLENT MIST OUTPUT: Our essential oil diffuser's large capacity reduces the need for constant refills, while it can continuously operate for up to a whopping 10 HOURS, bringing moisture 30-50ML/hour , covering area up to 10-60sq. WHISPER QUIET ULTRASONIC TECHNOLOGY: A perfect choice for any indoor setting, our ultrasonic diffuser's function will not interfere with your work or sleep schedule. As it moisturizes the air and cools your surroundings, it helps you breathe easier, decongest your sinuses and blocked airways, and revel in deep relaxation, throughout its use. 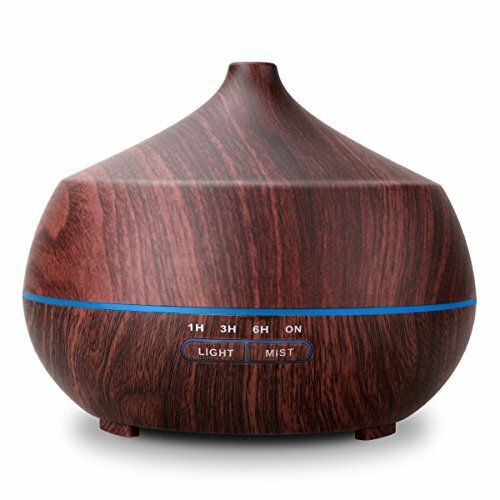 MODERN, UPDATED, WATERDROP-SHAPED DESIGN: The AROVA aromatherapy diffuser is coated with wood grain, making it a perfect addition to any contemporary home, office, gym, spa or studio. Compact and portable, the oil diffuser's cap can be effortlessly removed, making it easy to fill with water and a few drops of essential oil, helping you readily reap aromatherapy benefits, at all times. If you have any questions about this product by AROVA, contact us by completing and submitting the form below. If you are looking for a specif part number, please include it with your message.